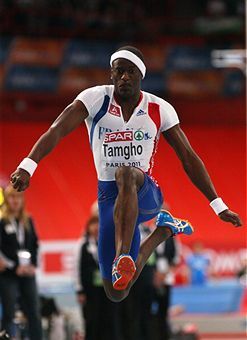 March 6 - France's Teddy Tamgho improved his own world record in the triple jump on his way to victory in the European Indoor Championships in Paris on today to send a London 2012 warning to Britain's Phillips Idowu. Tamgho jumped 17.92 metres in the second round, an improvement of one centimetre on the previous mark he set last month, and then equalled it for good measure in the fourth in a competition lacking Idowu, the world champion and Olympic silver medallist. Tamgho needed to be at his best with Italy's Fabrizio Donato jumping 17.73m for silver and Romania's Marian Oprea 17.62m for bronze. 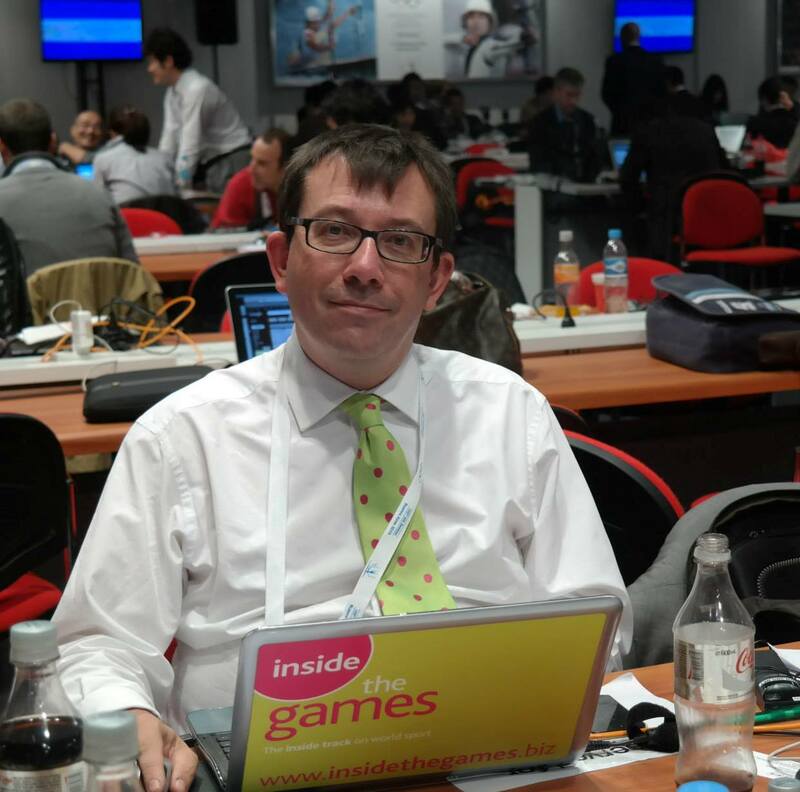 "The competition was very tough and intense," he said. "After Oprea and Donato jumped so far I realised I was only third and at home I couldn't imagine losing. "I did what I had to do to win, I was able to stay focused until the end. "I was hungry, I didn't want to finish with no medals [he was fourth in the long jump]." His win helped the home nation finish second in the medal table with 11 to Russia's 15, but local favourite Christophe Lemaitre had to settle for bronze in the 60m behind veteran pair Francis Obikwelu of Portugal and Britain's Dwain Chambers, the defending champion. Obikwelu, who lost out on gold to the disgraced Justin Gatlin at the 2004 Athens Olympics by one-hundredth of a second, proved to have the superior dip in the Bercy arena, east Paris, winning in 6.53sec. Chambers was 0.01sec off, with Lemaitre, who won an unprecedented treble sprint gold at last summer's Euro outdoors in Barcelona, could only manage third in 6.58. "I knew Chambers and Lemaitre were dangerous, so I just kept relaxed," said the 32-year-old Obikwelu. "I was hoping to be in the top three but I never thought I was going to win. I pushed fast and then it's just about running and having fun." Chambers, also 32, said: "It just shows that us older men can still run! "My ambition coming here was to win, but Obikwelu was better. "I struggled in the heat and semi-final, so I'm happy with silver." The 20-year-old Lemaitre, who won three gold medals at the outdoor championships last year in Barcelona, said: "I'm glad to get a medal but at the same time I'm miserable because I know I had the potential to win but I failed." Britain's team captain Helen Clitheroe led by example with gold in the 3,000m as Britain ended the European Indoor Championships with eight medals, twice as many than in Turin two years ago. Jenny Meadows won silver in the 800m and returned to the track an hour later to anchor the 4x400m relay team to another. But perhaps the most significant result came from 17-year-old sprinter Jodie Williams, who was just 0.01 seconds away from a medal in the 60m on her senior debut. At the other end of the age spectrum, the 37-year-old Clitheroe (pictured) claimed her first major title after holding off a determined challenge from Russia's Olesya Syreva to win by just 0.03 in 8min 56.66sec. "I still didn't know if I'd won it, even when I crossed the line," said Clitheroe. "My coach told me to believe in my kick, and reassured me that I could deal with anything happened in the race. "This is what I've been dreaming of for so many years." Barring injury, Williams will certainly compete in London but even exceeding expectations here will not persuade the A-level student to change her mind and compete at the World Championships in Daegu this year. "It's made me more sure that I am not ready for worlds yet," Williams insisted after finishing fourth in 7.21, equalling the personal best she set in the semi-finals, in a race won by Ukraine's Olesya Povh in 7.13. "It's frustrating to be so close to a medal but I was just happy to be in that race." In the women's 800m, Meadows led from the start and it looked as though her tactics would pay off until Russia's Yevgeniya Zinurova edged ahead just metres from the line. Meadows finished 0.31s behind with team-mate Marilyn Okoro fading to fifth. But the 29-year-old could be proud of her performance in the 4x400m relay as she ran a superb final leg to hold off France and ensure silver for herself and fellow 800m specialist Marilyn Okoro, Kelly Sotherton and Lee McConnell. Poland's Anna Rogowska won the pole vault with a clearance of 4.85m, Italy's Antonietta Di Martino took high jump gold and Spain's Manuel Olmedo won the men's 1,500m title.